Pics When Apple cofounder Steve Jobs passed away in 2011, makeshift shrines and memorial tributes popped up around the globe. Most of these iShrines were temporary in nature and were taken down after a few days (usually because mourners paid tribute in part by leaving fresh apples.) Other, more permanent tributes to Jobs have received mixed reviews. At least one, however, still stands, and it continues to catch the eyes and tug at the heart strings of Apple fans who pass through the town of Santa Cruz, California. 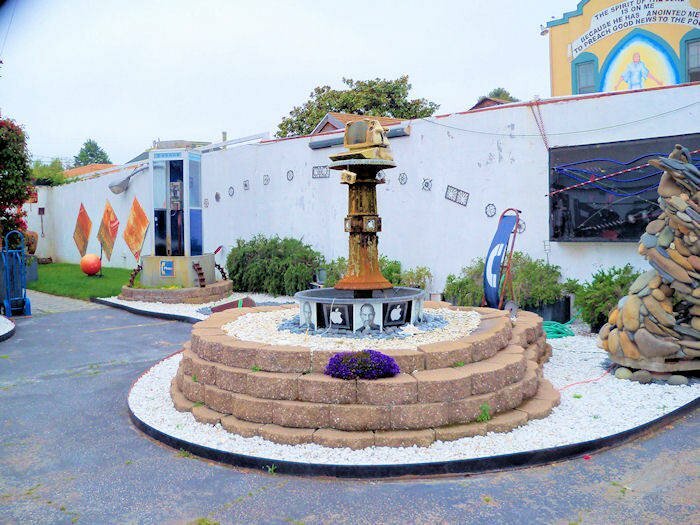 Reg reader John Pilge snapped a photo of this fountain-sculpture tribute to Jobs outside the town's Felix Kulpa Gallery. In it, a deformed Apple II computer sits atop a column (once the base of a street lamp) adorned with images of Jobs and the Apple logo, with water running into a pool of rocks below. The sculpture is fascinating itself, and as with most things in the ocean-front city just over the hill from Silicon Valley, it has an even more interesting back story. Artist Robbie Schoen told El Reg that the piece has its origins at Jobs' hometown of Cupertino. Schoen, an artist who works with found objects and once attended Cupertino High, was given the melted Apple II by a friend in the school's science department after an arson fire damaged the system. Taking inspiration from the scorched computer, Schoen built a sculpture with the computer that he called "Baked Apple". He said that he even sent pictures of the sculpture to Jobs who, at the time, was in the process of moving from Next to Apple. The artist reckons that sending Jobs photos of the melted computer in a brochure with the words "Steve, do you have an appetite for a Baked Apple?" might have given the Apple founder the wrong idea. "For me to send him a brochure that had that picture of his baby, it was kind of like sending the severed ear of your son or daughter to the parent," Schoen mused. 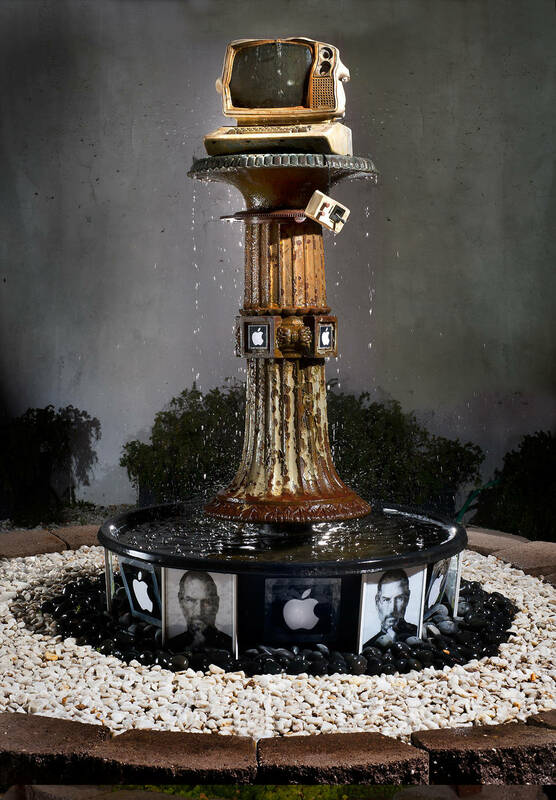 When Jobs passed away in 2011 following a lengthy battle with pancreatic cancer, Schoen took inspiration to turn the former Baked Apple into a fountain tribute to the tech icon. He completed the work which now stands outside the gallery and, according to Schoen, still inspires passerby to stop and take a closer look. Schoen himself is far from an Apple fanboi. The artist said that he does not own a computer or use email. Thanks to John Pilge for the tip and photo.